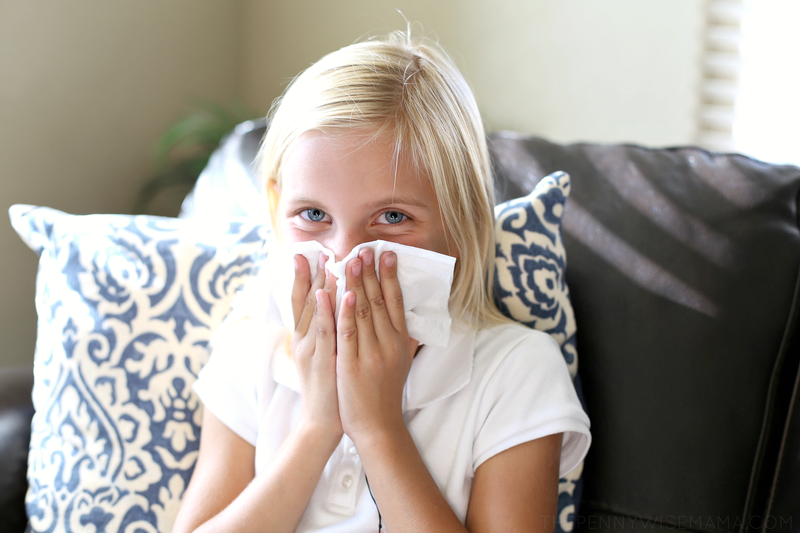 The kids are back in school and you know what that means…cold and flu season is right around the corner. 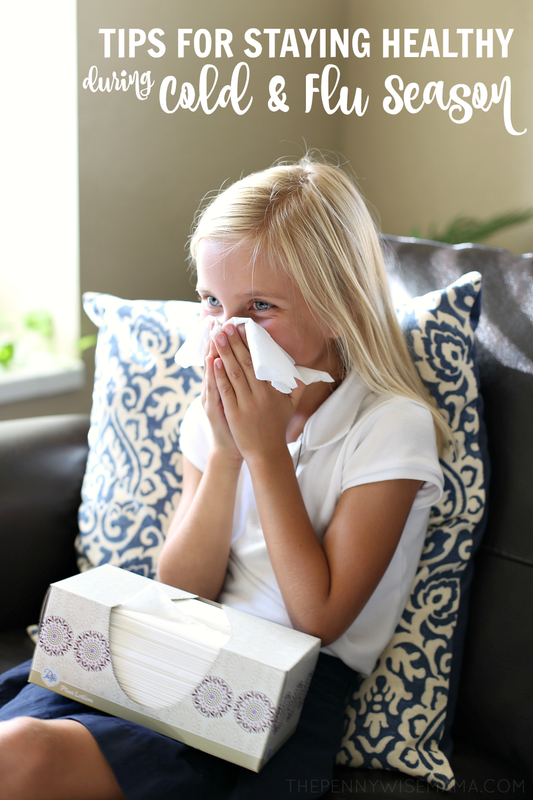 Between all the germs being passed around at school, the change in weather, and being cooped up indoors, it’s inevitable that we will get sick at some point. School just started and there’s already a bug going around. I figure it’s only a matter of time before we get sick, but I’m really hoping we can avoid it. We’re doing everything we can to stay healthy and you should too! Below you’ll find some of my tips for staying healthy during cold and flu season, as well as how to cope if you do get sick. 1. Take a Daily Multivitamin – Even if you eat healthy, a multivitamin fills in any nutritional gaps. It also helps support a healthy immune system. 2. Get Plenty of Sleep – We all know that sleep is important. It helps your body heal and repair and it helps you recharge so you can conquer your day. 3. Exercise Daily – Play a sport, go to the gym, join a running club, etc. Exercise helps you maintain a healthy weight and boosts your immune system. 4. Stop the Spread of Germs – Wash your hands frequently (scrub, rub and lather for 20 seconds) and cough or sneeze into a tissue or the crook of your elbow to prevent the spread of germs and bacteria. 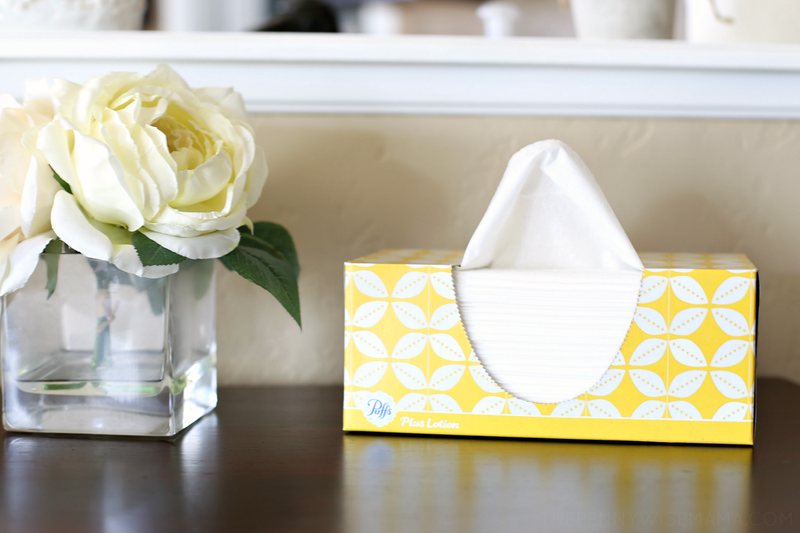 Puffs Plus Lotion tissues are awesome to have on hand during cold/flu and allergy season. 5. Eat Healthy Foods – A balanced diet containing fruits, vegetables, whole grains and lean meat will provide your body with the nutrients it needs to run efficiently. 6. 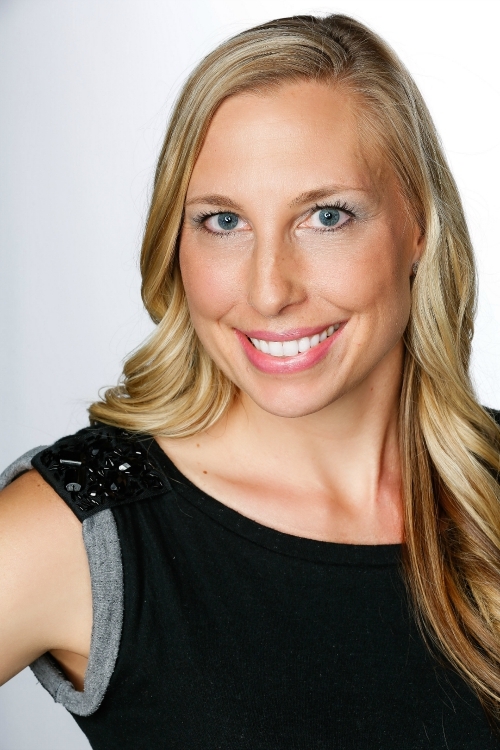 Clean and Disinfect Your Home on a Regular Basis – While I am not a fan of antibacterial sprays or soaps, I do think it is important to disinfect your home on a regular basis. I like to use Thieves Household Cleaner, an essential oils based cleaner that cleans and disinfects effectively without the use of harmful chemicals. The reality is you could do each of these things on a daily basis and still get sick. In the event that you come down with a cold or flu virus, it’s important that you give your body everything it needs to get back on track. Drink lots of water, continue to take your vitamins, supplement with Vitamin C, eat healthy and get plenty of rest. If needed, take over-the-counter medication and make sure you have plenty of Puffs Plus Lotion on hand to give your family the comfort of soothing softness. 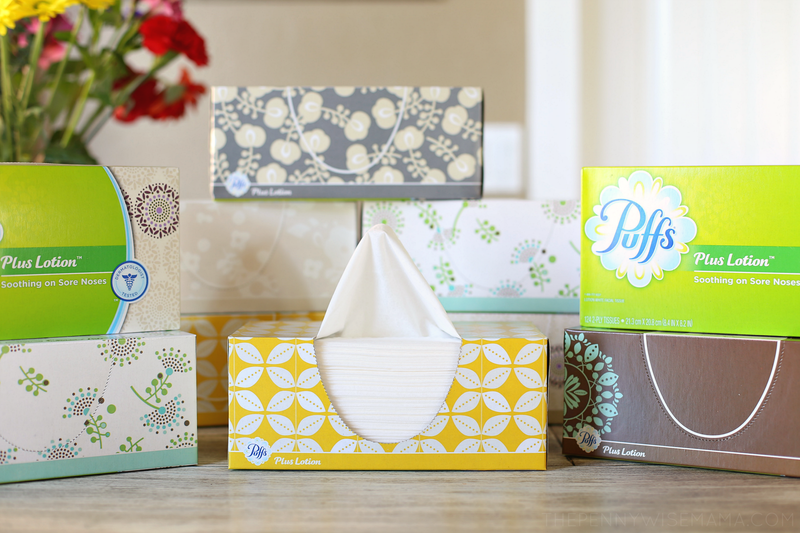 I’m really hoping that we stay healthy throughout cold and flu season, but in the event that we get sick, we will be prepared with plenty of Puffs Plus Lotion tissues! I found a great deal on a 10-pack at Sam’s Club, which literally allowed me to put a box in every room of our home, as well as both of our cars. I’m really loving all the fun prints — they blend in well with any decor! 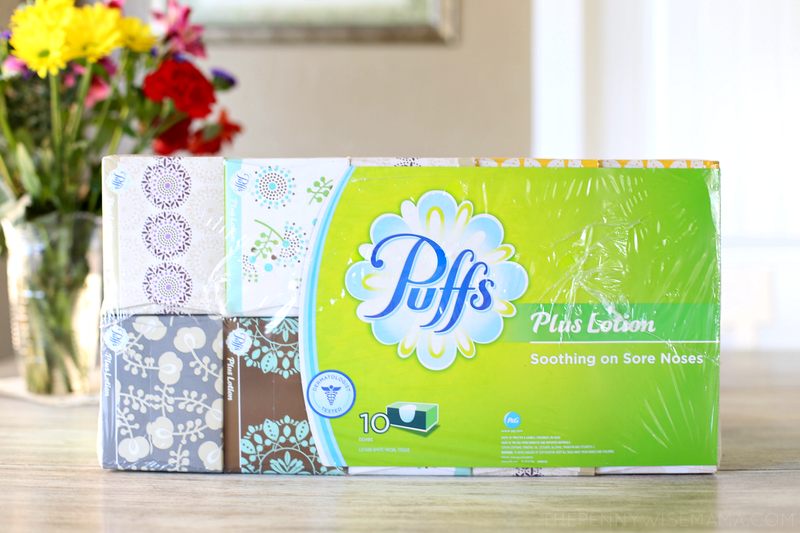 Puffs Plus Lotion isn’t just any ol’ tissue. It’s thick and strong, yet extremely soft and soothing. With a touch of shea butter, aloe and vitamin E, it is gentler on the skin than ordinary tissue. It’s so soft and soothing, especially on tender skin. It’s perfect for sore, runny noses that need some extra softness during cold and allergy season and it’s gentle enough even for the most sensitive skin. Puffs Plus Lotion is essential during cold/flu and allergy season. Make sure you’re prepared when sickness hits by stocking up on a 10-pack of Puffs Plus Lotion, now available in club and on Samsclub.com for a terrific value. Enter to win one $250 Sam’s Club gift card for yourself and one $250 Sam’s Club gift card to give away! Share the soothing softness of Puffs Plus Lotion with your family and friends. Giveaway ends on 9/27. Open to U.S. residents, 18+. Good luck! That’s the first thing we need when it’s a cold season! Great post!